red, black 'n' grey; and th' tide stretches back as far as thayse tired owd eyes of marne can see fer. Pretty soon, ah suppose, ah'll bay the eownly one arahind 'ere that's left…"
Tales from a changing city is the first of a series of exhibitions from the community based company of the same name. The company was formed by Local Photographer Darren Washington And local Writer Danny Hill. The aims of there company is to highlight all aspects of change from a city undergoing vast regeneration. 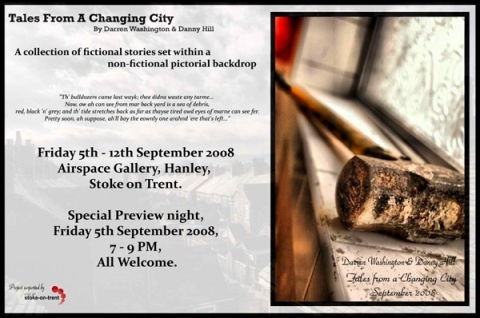 Starting with a selection real life images from the changing city with a collection of fictional stories in the first of series of exhibitions with many different styles and collaborations of work to come. 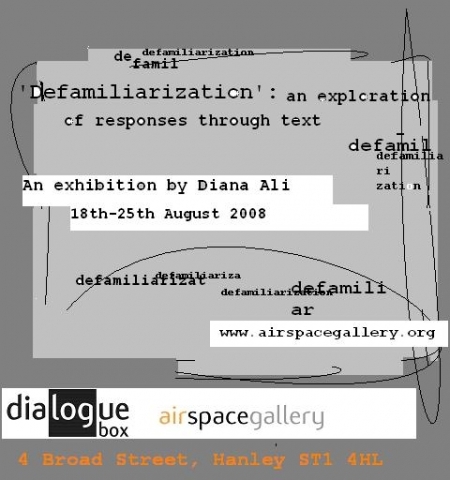 'The Dialogue Box exhibition displays a stage of the ‘Defamiliarization’ project. The words exhibited are passed onto an artist in a different country. This artist then alters or re- interprets the words and substitutes it’s textual format into a visual one. They then take a digital picture of its revised form. The photograph must be a representation or be characteristic of the city or country it is in. 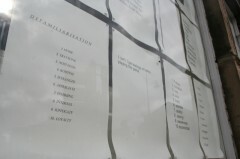 All photographs are then returned to the original artist who came up with the words so they are re-introduced to the ‘defamiliarized’ version of their words. The work started from local contributors and has now expanded around the globe. It questions the interpretation of someone’s creative thoughts into another’s and the visual interpretation of the written word. Who has the authorship to do this? But at the same time the project is allowing artists from around the globe to share their joys and anxieties of their heritage, language and countries to each other. As Dialogue Box comes to a close this year we are hurridly planing the next series and will be updating the blog with news on it's progress. We are really pleased with the work that has been shown, we have had some great responses and have enjoyed working and making connections with all the artists involved. This years degree show at the AirSpace Gallery came with a twist, by choosing to exhibit students from both Staffordshire University and Loughborough University AirSpace hope to encourage communications between different artists and also to deliver an even more diverse show. The eight recent BA graduates provided the gallery with just that; from freakily realistic wax figures in the window, to a loud exercise video the exhibition was filled with excitement, and yet punctuated with moments of clarity. 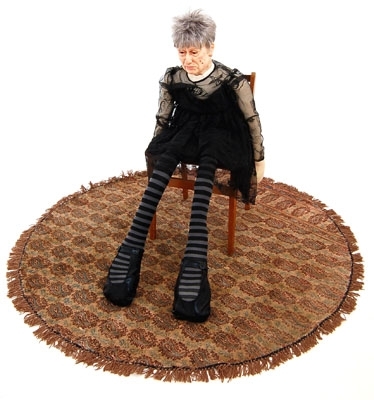 Wendy Meyer provided a distraction for the streets of Hanley with her lifelike sculptures in the window space of the gallery. Meyer made her self young by placing a wax replica of her own head in a pram with a babies body attracting attention from passers by, even some who complained on the sunnier days when the figures were removed for fear of melting; ‘I’m not sure if I like it but I still want to see it’. This was juxtaposed with an aged image of herself situated inside. Meyer here is dealing with self perception, do I look old? Do I look young? Matt Smith entertained us with short videos created using a blue screen technique; to see a person trying to interact with themselves again brought thoughts of self perception. If I wasn’t me would I like me? These types of questions were consistent throughout the exhibition and remind you of what it is to embark on a new beginning. 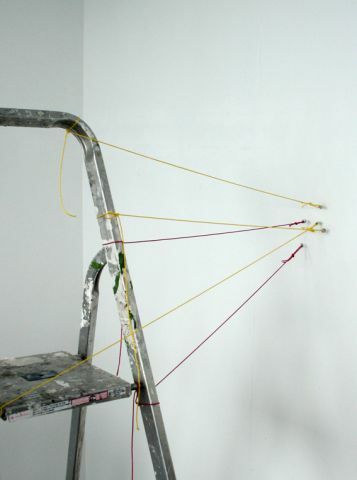 Other artists, including Alishia Morrison and Joanne Mostyn, used subtler techniques to bring equally powerful suggestions of self. Morrison uses rusting metal with childhood memories to discuss the effects of physical scars and Mostyn creates delicate monochrome sculptures representative of an obsessive desire to build a safe world around her self. Coinciding with the opening of ‘Who Are We? Who Am I?’ was the celebration of the 2nd birthday of the AirSpace Gallery. Directors David and Andy gave a short thanks to all those that have helped them and AirSpace get this far and then a quick pose for photographs before digging into the birthday cake. Artists include: Kate Lynch, Wendy Meyer, Matt Smith, Helen Saunders, Jack Tierney, Aleshia Morrison, Ian Williams and Joanne Mostyn. The final show in the first Dialogue Box series opens in this monday. Diana is a British-Syhleti artist. She has worked in mixed media painting, photography and installation. 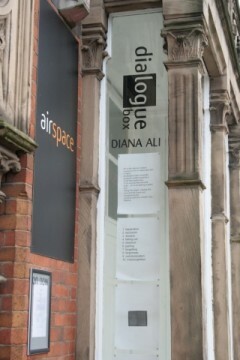 She has exhibited in various venues such as, Salford Working Mens Club and Bonnington Gallery, Nottingham. She is currently exploring the visual and the verbal as an art form by involving artists’ responses locally, nationally and internationally. 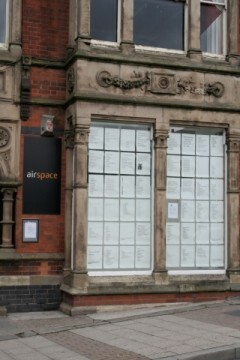 The first Artist led Contemporary Art Gallery in Stoke-on Trent. As a newly formed arts organisation, our initiative is to help develop the contemporary arts culture within the Stoke on Trent area. Exhibiting professional and developing artists, aiming to engage with the local community.